The Bag Lady From The Bay: Where'd The Week Go? I simply cannot believe it, another week has flown by and I haven't posted since last Sunday! The time really flies when your busy and not paying attention to the days of the week as they fly on past. Last week my Exchange Student went home. While he was here, his presence helped keep me tuned into what day it was, what time it was and the chores that come with having another being in the house with me. When he left, there was no reason to set the alarm for a certain time each morning, or to make certain a good supper was ready for him on time, nor making certain his school lunch bag was properly filled...nope, none of that needed to be paid attention to because he went back home to his Host Mother, who had a wonderful week at the Annual Quilt week in Paducah. This week while though I have not been posting, I have been busy, first I changed the bed linens and washed the ones I took off, I gathered up as many of my sewing tools and notions and put those all away where they belonged and then set about creating and sewing more totes and cosmetic bags. I am crossing my fingers some of these if not all will be sold out over this coming summer at the weekend markets. I have stocked my Etsy Shop with the hopes that buyers out there might see something I have made and want it. Right now the many sellers who sell handmade fabric items are not selling like they did last year and the competition is fierce what with Etsy now allowing mass manufactured goods to be sold as well. This doesn't help those of us who make handmade goods for sale at all. I decided that this year I would try my hand at selling at the weekend Farmers' Markets and a store in a town a half hours run from my home. One can but try, right? I also have some charity quilts to finish up so the sooner I get those out and finished and delivered, the better off I will feel..
A dear friend went to Paducah last week and came home with pretty fabric gifts for me, she hasn't had time to share what all she saw whilst there, but, I will see her soon and get to experience Quilt Week second hand. 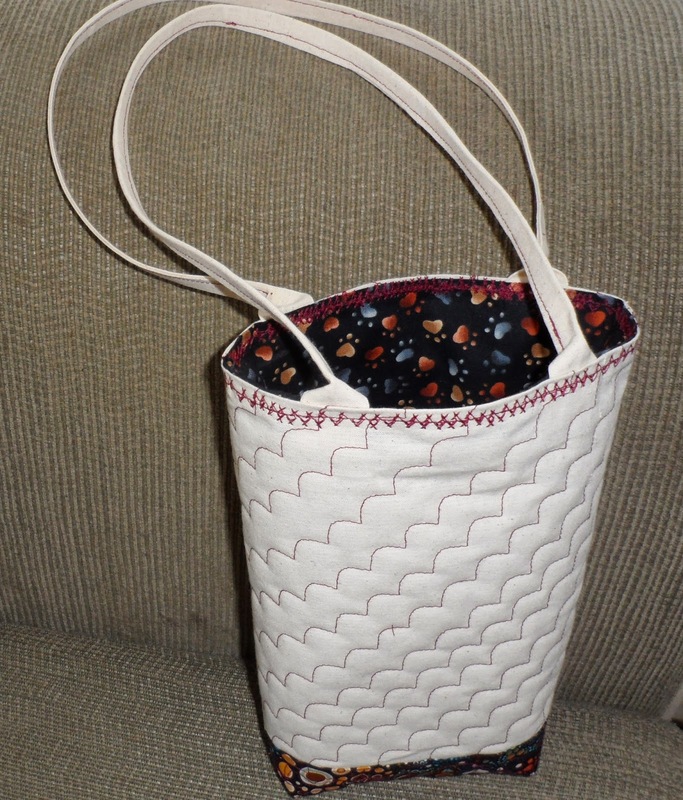 I have already used some of the fabric in a tiny tote bag this week, isn't it cute for the size of it? I have been hatch quilting my fabrics over these past many months, but the other day I just felt lazy and so I used a stitch from my sewing machine and sewed controlled lines of it, as the picture shows, it didn't turn out too badly. Then I embroidered another stitch around the top of the bag, close up it looks great, far away, hmmmmm I am not to certain. What do you think? Don't you just love being gifted with fabrics? I certainly do and when I get such gifts I walk around constantly thinking about what I might use them in. Time for me to wish you a very Happy Weekend and thank you so very much for stopping by to visit, I certainly appreciate it. Any comments or opinions you might have are also welcomed.